Engineers and technicians responsible for industrial processes that require carbon dioxide or produce CO2 as a byproduct will find the advanced ST75 Flow Meter from Fluid Components International (FCI) delivers precise direct mass flow measurement of gases in an easy to install insertion style instrument that requires almost no maintenance over a long life. The ST75 Flow Meter is ideal for the measurement of CO2 in a variety of industrial applications. CO2 is commonly utilized in the bottling of beverages that include soda drinks, beer and sparkling wine. It is also commonly recovered from hydrogen and ammonia production plants as well as natural gas wells, and is also used to enhance production from older oil wells. FCI’s ST75 Flow Meter is a highly rugged and reliable instrument designed for demanding process industry plant environments. With an extensive set of standard features, the ST75 Flow Meter is designed for line sizes from 6 to 51mm. The ST75 provides three unique outputs: the mass flow rate, totalized flow and media temperature. With accuracy to ±1% of reading and ±0.5% repeatability, the ST75 Flow Meter’s design includes media temperature compensation to ensure performance under variable process and plant temperature conditions. Its precision flow element has a no-moving parts design that employs platinum RTD sensors embedded in equal mass thermowells with microprocessor electronics that can be calibrated to laboratory standards for CO2 as well as many other gases. The ST75 Flow Meter operates over a wide flow range, from 0.01 to 950 NCMH depending on line size, which makes it equally well suited for low flow and high flow applications. For variable process conditions, the ST75 is factory preset to a wide turndown range at 10:1 to 100:1. Developed with FCI’s proven thermal dispersion technology, the ST75 provides direct-flow measurement for more accurate performance at a lower cost by eliminating the need for temperature sensors, flow computers, or other devices that are required with orifice plates, Venturis, Vortex shedding, and other meters. Its no-moving parts design ensures superior service life. There are no orifices or inlets to clog or foul, which significantly reduces scheduled maintenance and unplanned shut-downs. For ease of application, the ST75 Flow Meter’s standard outputs are fully scaleable 4-20mA and 0-10V. They are user assignable to flow rate and/or temperature and a 0-1kHz pulse output of total flow. The instrument can be ordered for input power with either 18 to 36 Vdc or 85 to 265 Vac, with or without a built-in LCD digital display. Manufactured with a rugged sensing element utilizing all welded 316 stainless steel construction and Hastelloy-C tips, the ST75 is enclosed in a rugged, all-metal, dust and water resistant NEMA Type 4X (IP66) rated package designed for hazardous area installations. Approvals include: Class 1, Div. I Groups B, C, D. Div. II Groups A-D; ATEX/IECEx Zone I, II 2 G Ex d IIC T6…T3; II 2 D Ex td A21, IP67 T90°…T300° (pending); FM/CSA/CRN and CE Marked. For CO2 measurement and monitoring, the ST75 provides an accurate, fast response and low-maintenance solution for carbon dioxide applications. 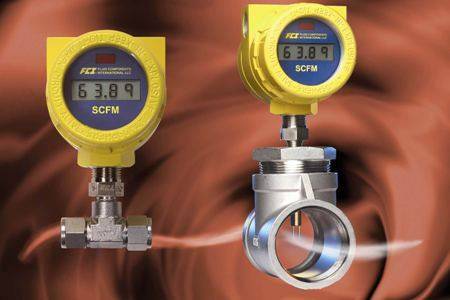 Whether adding flow sensing to improve a process or replacing poorly performing or high-maintenance flow meters, it is an efficient and economical choice for flow measurement and monitoring in a variety of industries.